Early in 1954 the Federal Department of Northern Affairs and National Resources sent a survey team north to the Mackenzie Delta to find a site on which to build a new town. The Advisory Committee on Northern Development, made up of senior Ottawa government employees, had met to study the problem of Aklavik (map) and concluded that this community couldn’t be saved and that a totally new town had to be built. Back in 1912, when the Hudson’s Bay Company selected a location for their Mackenzie Delta trading post – which they named Aklavik – the instability of both the shoreline and the soil on which the post was built wasn’t much of a problem. As time went by this location attracted more people and services and by the 1940s it was realized that the community had nowhere to expand. Sandwiched between a channel of the Mackenzie River and a low lying area of lakes and muskeg Aklavik was plagued by spring floods and had a reputation as the muddiest place in the north. The survey team for the new town site looked for a large, flat area close to a good location for an airport, one that had stable soil, was well out of range of spring floods and had access to the Mackenzie River. Nine sites that met these criteria were found but the one that these surveyors called East Three seemed to have the greatest potential and it was picked as the site for a new northern town. 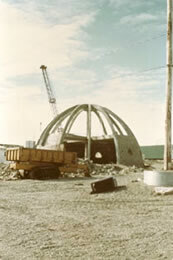 The name East Three was quickly dropped and people began to refer to this site as New Aklavik. Construction in the summer of 1954 began with an airport, a wharf, some warehouses and a camp to house hundreds of workers. After debate in the north and in Ottawa Knut Lang, the Mackenzie Delta representative on the Council of the Northwest Territories, suggested the new town be named Inuvik, a somewhat contrived Inuvialuktun word meaning ‘place of man’. Commissioner Robertson officially proclaimed this name on July 18, 1958. Aklavik, the town that everyone said would soon be abandoned, lives on and over the past fifty years, has more than doubled in size, which is why their community flag bears the motto “Never Say Die”.